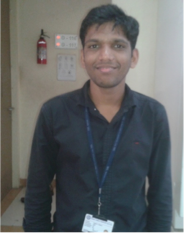 I am Chinmay G. Nardele, CSIR-Senior research fellow, working as Ph.D student at CSIR-National Chemical Laboratory, Pune under the supervision of Dr. Asha S. K. I have obtained B. Sc. (2005) and M. Sc (2007) degree from Swami Ramanand Teerth Marathwada University. Currently we are interested in developing photoresponsive liquid crystalline polymeric materials based on azobenzene chromophore. The LC image is of a dendritic tetraped molecule bearing azobenzene chromophore substitution on each arm. The higher ordered smectic mesophase was observed upon slow cooling from isotopic melt. The powder sample was sandwiched in between cover slips on the hot stage. It was heated to isotropic phase and slowly cooled to room temperature (25 ºC). 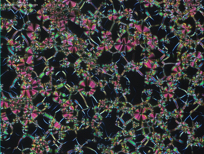 The photograph was captured at 25 ºC using polarized optical microscope (PLM) LIECA DM2500P equipped with Linkam TMS 94 heating and cooling stage connected to a Linkam TMS 600 temperature programmer. More detail about the molecular design and LC texture formation could be found in the article Journal of Physical Chemistry: Part B - DOI: 10.1021/jp410589h. Jury comment: Rose on wire netting.